The highlight of Science Week (see below) was a talk on Monday evening at University College Cork by Anton Zeilinger, the world’s foremost quantum experimentalist. The title of the talk was ‘Quantum puzzles and their applications in future information technologies’ and it was sponsored by Science Foundation Ireland, the Institute of Physics and the Tyndall Institute. (The connection is that Sile Nic Chormaic, the leader of the quantum optics group at the Tyndall Institute, is a former member of the Z. group). Zeiinger started with a brief introduction to quantum theory, from Planck’s quantum of action to the emergence of wave theory. He then focused on the problem of interpretation, starting with Bohr’s double slit experiment. Having explained the ideas of interference and entanglement, the theme of the talk was set at at the difference between Bohr’s spooky-action at a distance and Einsein’s refusal to yield either locality or realism. Z. then gave a clear depiction of Bell’s theorem and described how the experiments of his own group effectively ruled out hidden variable theory, leaving the question of whether locality or realism was violated. He also mentioned recent tests his group have done that point at the latter, you can read a good account of them here. In the second part of the talk, Z. gave a masterly overview of the applications of entanglement – teleportation, encryption and quantum computing – and described the astonishing progress of his group on each. Funding agencies should note how experiments concerning the esoteric question of the interpretation of quantum physics turned out to have important practical applications. Interestingly, Zeilinger returned to the nature of reality in the final part of the talk. After a careful discussion of recent experiments, he discussed the modern philosophy that it is operationally impossible to seprarate reality and information in any meaningful way, finishing with his own view – that information, not reality, is the fundamental aspect of our lives. All in all, this was a fabulous talk on cutting edge quantum research and its applications. P.S. Zeilinger has a well-known blog here, but you’ll need to brush up on your German! Thanks for writing about Zeilinger’s lecture. I’ve recently read about his experiments here and I thought very interesting. 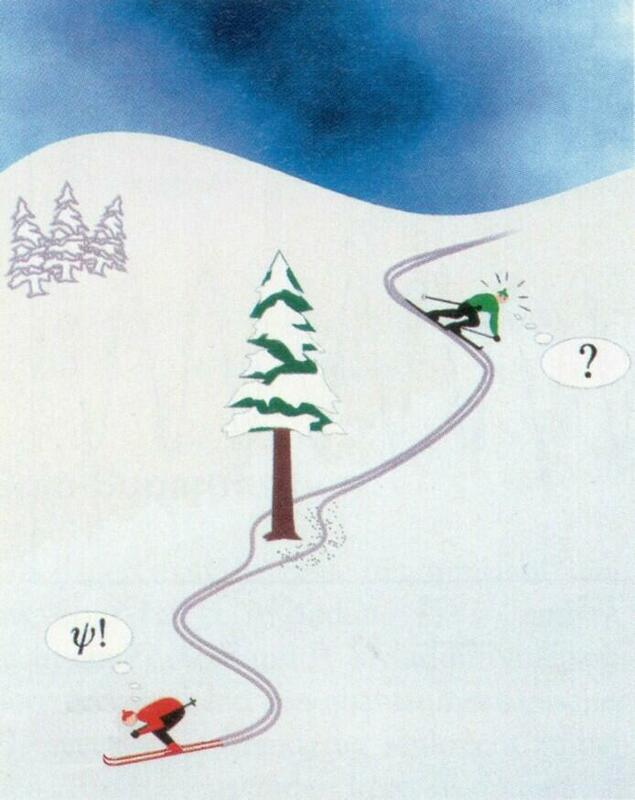 The drawing about the skiers is great too, it reminded me the work of this artist, e.g. the headlights of the truck going in two different directions. I was thinking that if the skier’s trace on the snow is seen as flow (or the electric beam is interpreted as flow), at least visually, we could explain the split at the tree without a paradox. So if the beam is interpreted as a flow instead of probability waves or particles. Do you happen to know any references on a similar speculation? And are there supposed to be 3 more pictures of the skier? I see three broken links next to it? Great reference Zeynel, I enjoyed that article. It explains the concepts of locality and realism very well.